A 2-month old dog with respiratory signs was being evaluated and a routine CBC was submitted to IDEXX. An in-house chemistry panel was performed by the referring veterinarian and all values were within normal limits. Take a look at the slides below, interpret the slides, and make your diagnosis. 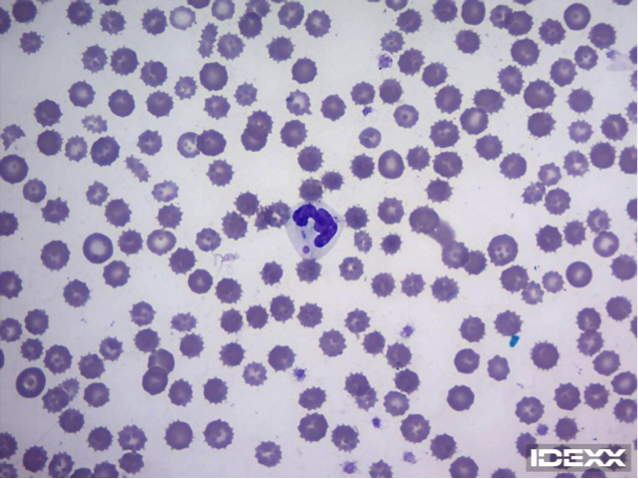 Within neutrophils and lymphocytes are variably sized (range from 1 to approximately 7 microns in length and 1-4 microns in width) and shaped (often round to occasionally oblong or angular), homogenous, pink inclusions that are consistent with distemper viral inclusions. Confirmatory testing is recommended (See below). There is also a left shift with moderate to marked toxic change and a monocytosis consistent with an inflammatory leukogram. This type of inflammation can be seen with a variety of causes and is likely related to the Distemper infection but other contributing causes cannot be ruled out. There is a moderate, currently non-regenerative anemia. This may be due to a variety of causes including iron deficiency or inflammatory disease (later suspected). This can also be seen with acute blood loss or acute hemolysis and these become regenerative in time. Continued monitoring of CBCs is recommended. The presumptive diagnosis is canine distemper virus (CDV) infection. Confirmatory testing was not performed through IDEXX. 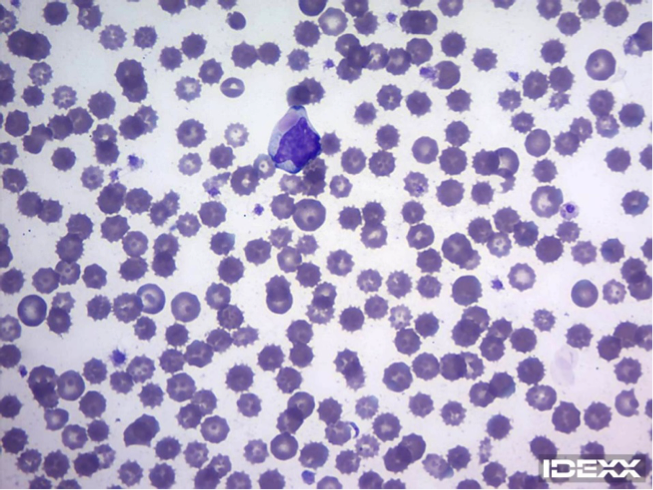 Despite this, the findings within the blood smear are pathognomonic for infection with canine distemper virus. Canine distemper virus (CDV) is a highly contagious, systemic, viral disease that can affect dogs as well as some wildlife species. The main route of infection is via inhalation of aerosol secretions from infected animals. The virus first replicates in respiratory lymphatic tissue and then results in systemic infection (typically infecting the respiratory, GI and nervous systems). Clinically, infection initially results in a fever (diphasic) and vague signs of illness that progresses to variable combinations of GI, respiratory and potentially neurologic signs that may range from mild to severe. Clinical signs may also be complicated by secondary bacterial or other infections. 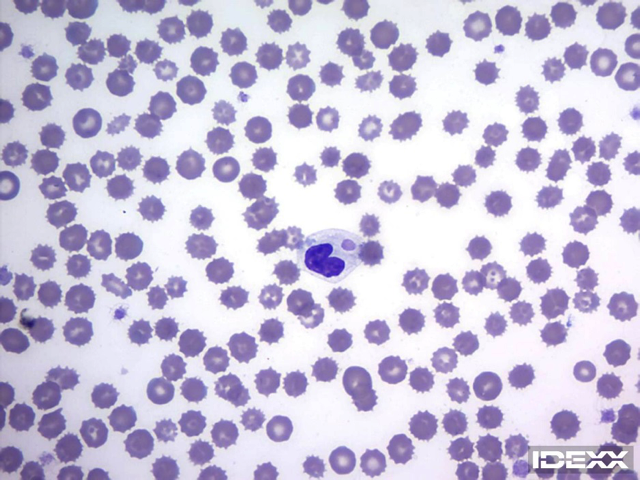 Distemper viral inclusions may be present rarely and transiently in blood cells (RBC and WBC) in some dogs during the acute viremic stage and noted on blood smear review. When seen they are pathognomonic for CDV. The inclusions are viral nucleocapsid aggregates that formed in precursor cells in the bone marrow. As seen in this case, they are variably sized (generally 1-4 microns), round to oval to irregular, homogenous and stain blue-gray to red/pink depending on the stain used. They are typically easier to see (more red in color) when stained with aqueous Diff-Quik stain. Inclusions are rarely seen, therefore, other testing is recommended for diagnosis of a distemper viral infection. Diagnosis can be made with reverse-transcriptase (RT)-PCR (RealPCRTM through IDEXX) on a variety of samples including respiratory swabs, blood, urine and cerebrospinal fluid or via an immunofluorescent assay. RT-PCR can usually distinguish natural infection from vaccinal virus but recent vaccination can complicate this. For this purpose, IDEXX also offers a Quant RealPCRTM (for respiratory samples) that can be used in patients vaccinated within the previous 4 weeks with a modified live vaccine. Serology (antibody titers or ELISA; especially IgM) can be helpful in unvaccinated dogs and potentially dogs vaccinated greater than 1-2 months prior to testing, but serology is generally not suggested for those with an unknown history or previous vaccination as results are difficult to interpret. Antibodies can also be measured in CSF and if detected are generally specific for disease. There is no specific treatment for distemper infection and treatment is typically symptomatic and supportive medical care. With prompt, aggressive care, infected dogs may recover, but in some case neurologic signs may persist after other signs have resolved. If neurologic signs are progressive or severe, treatment is frequently unsuccessful. Ultimately, prevention though vaccination as well as preventing potential exposure (limiting exposure to wildlife, unvaccinated animals, other animals while immune system is immature, etc) are key. “Viruses, Canine Distemper Virus.” ECLINPATH, Cornell University College of Veterinary Medicine, 2013, www.eclinpath.com/hematology/infectious-agents/viruses/. Accessed 28 February 2018. Harvey, J. Veterinary Hematology, A diagnostic Guide and Color Atlas. St. Louis: Elsevier, 2012. Creevy, K. “Overview of Canine Distemper.” Merck Veterinary Manual, 2018, www.merckvetmanual.com/generalized-conditions/canine-distemper/overview-of-canine-distemper. Accessed 28 February 2018. Techangamsuwan, S and M Kennedy, “Canine Distemper Virus.” Clinician’s Brief, November 2014; 19-23, www.cliniciansbrief.com/sites/default/files/attachments/Canine%20Distemper%20Virus.pdf. Accessed 2 March 2018.